lasting bonds with our customers and therefore we are committed to offer the best service. Our aim is not only to find new customers but to retain the existing ones. Each customer is unique and must be treated with a unique way. In FRIGO FOOD we reward our partnerships and we listen carefully to our old and new customers so as to fulfill not only their product needs but their preferences in the way we deliver and we communicate things to them. 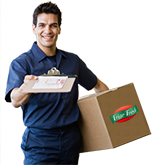 All of FRIGO FOOD employees work daily so that there are quality checks at all stages of an order execution from the minute the order is received till it is delivered to the customers. Furthermore we try to provide prompt service to meet the deadlines and to deliver our products in excellent condition. To achieve this we use not only the company fleet but we have invested in transport companies that meet all the requirements for the transportation of our frozen products.